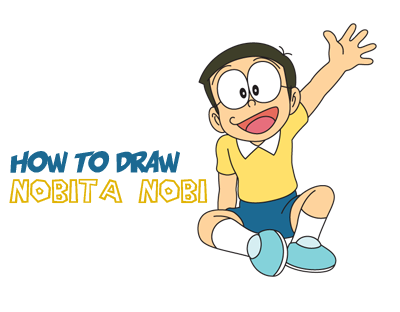 Learn how to draw Nobita Nobi from Doraemon with the following easy-to-follow, step by step instructions. If you can draw basic geometric shapes, letters, and numbers then you will be able to following this simple tutorial. Get drawing! 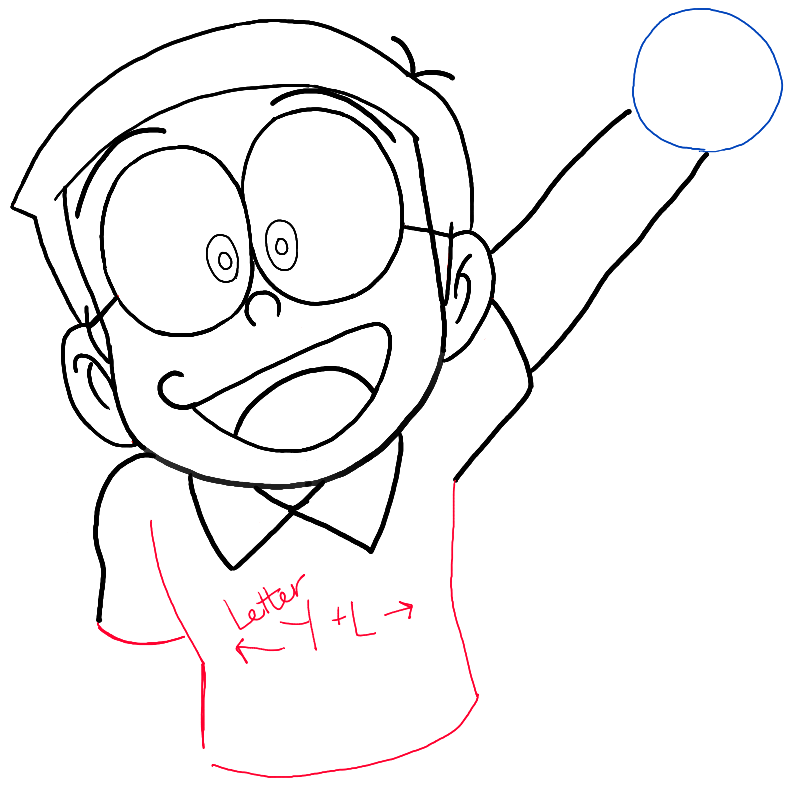 Start by drawing Nobita’s face. 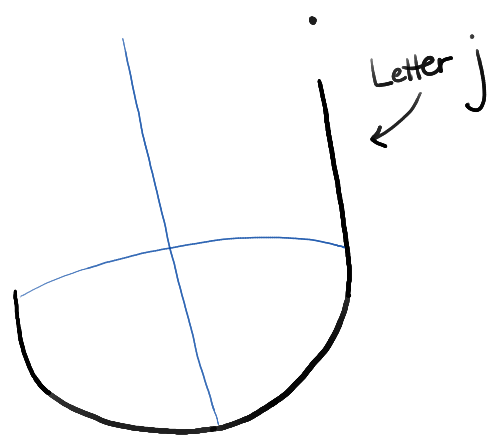 Draw a letter ‘j’ shape. Then draw guidelines within it. This will help you place the facial features in the right place. Draw a curved line at the top of the head. 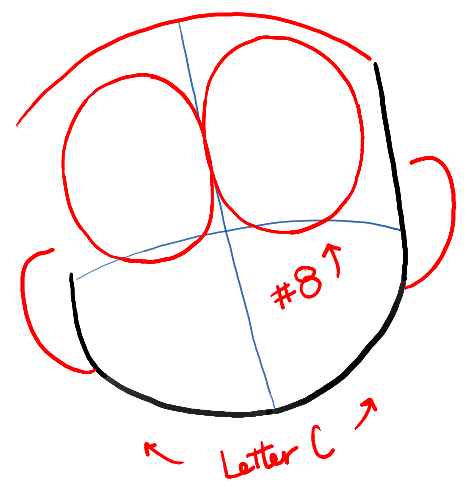 Draw letter ‘C’ shaped ears. Draw 2 circles for the eyes (sideways #8 shape). 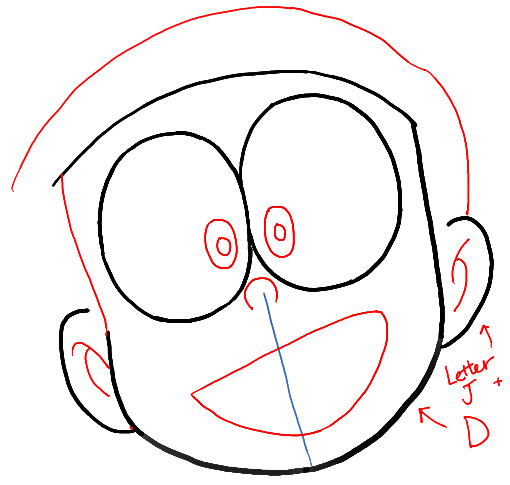 Draw a curved line at the top of the head for the hair. Draw a letter ‘J’ shape in each ear. Draw 2 ovals in each eye. Draw a sideways letter ‘C’ shape for the nose. Draw a sideways letter ‘D’ shape for the mouth. Draw a letter ‘V’ shape at the top of the hair and for the neck line. Draw curved lines for eye brows. Draw a sideways letter ‘T’ shape above each ear. 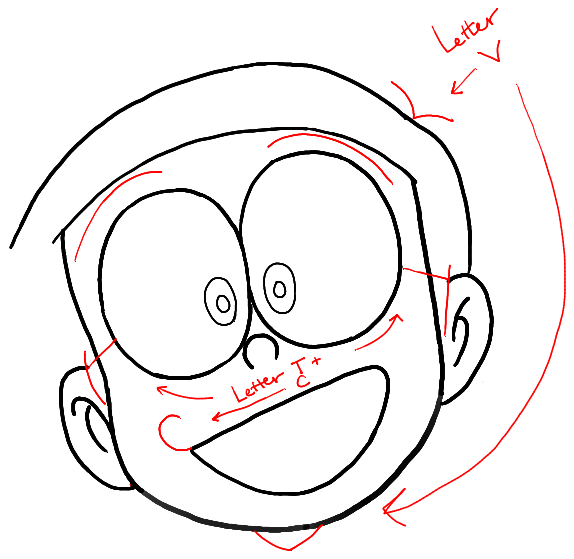 Draw a letter ‘C’ shape at the left side of the mouth. Draw a #7 shape on the left side of the hair. 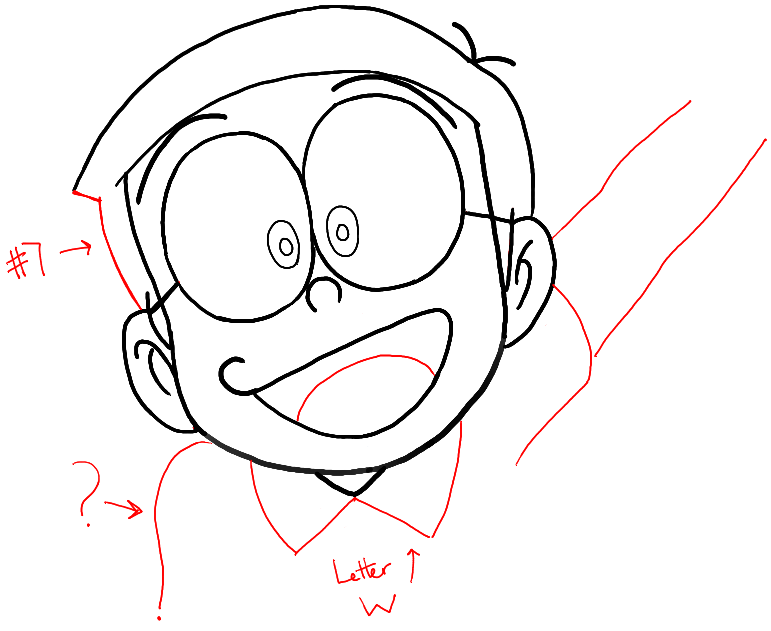 Draw a ?-shape for the left shoulder. Draw a letter ‘W’ shape for the collar. Lightly draw a circle for the guideline for the right hand. Draw letter ‘M’ shapes for the fingers on the right hand. Draw ovals for the guidelines for the legs. Draw letter z-like shapes within the legs. – Draw the lower legs. 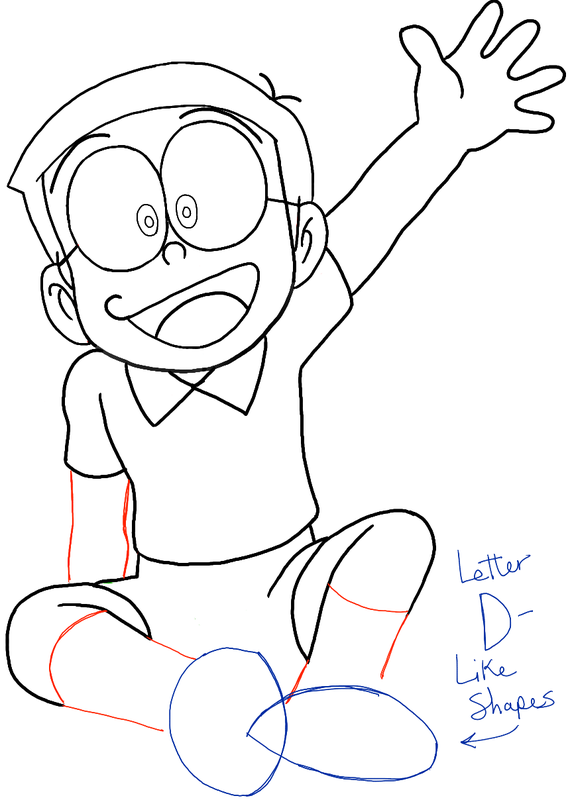 Draw letter ‘D’-like shapes for the feet. Draw details int he shoes. 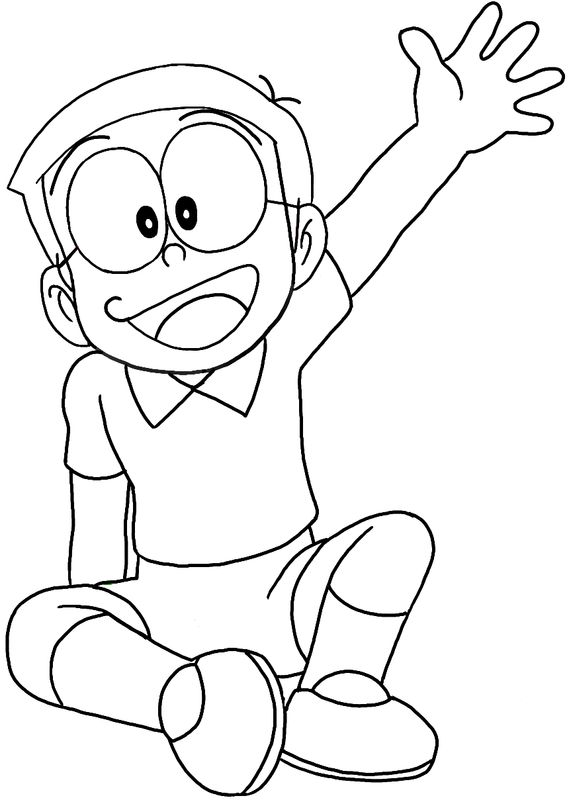 And here is the finished drawing of Nobita Nobi. I hope that your drawing turned out just the way you wanted it to. Come back soon for more drawing tutorials. I hope that you had fun! 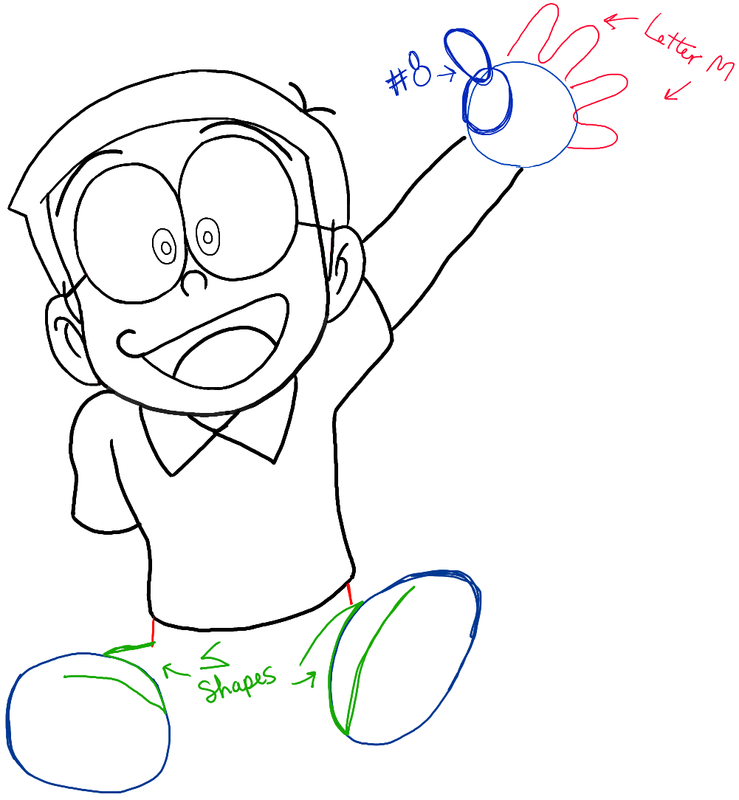 This article was written on 26 Oct 2015, and is filled under Doraemon.